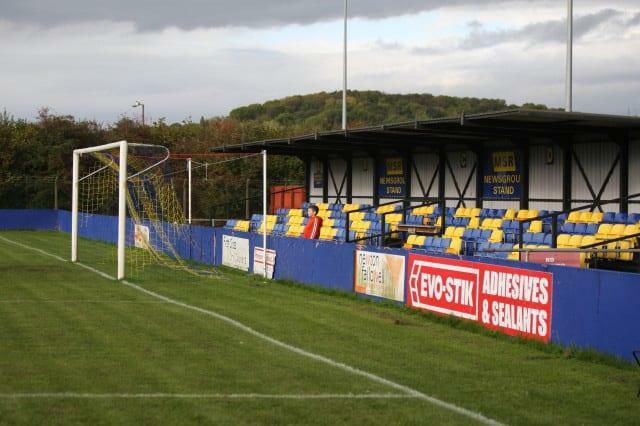 Carlton Town lost a third match in succession as they went down 2-1 at home to Brighouse Town. To add injury to insult, striker Tyler Blake, making his first start this season after re-signing in the week, left the field on a stretcher with what looked to be a serious injury. Chairman Mick Garton will also be concerned at the low attendance. Just 67 were present for a Saturday match, the lowest for some years. Following defeats against Wisbech and Worksop, manager Wayne Scott made three changes, bringing back Daniel Fletcher and Ben Hutchinson in addition to Blake, with Khyle Sargent, Jordan Pick and Luke Smithson making way. With new signing Joshua Kwadu on the bench, there was no place in the 16 for Kyle Stovell. Brighouse started the better in this first ever meeting between the clubs and Jack Steggles made an excellent save as early as the seventh minute, tipping away a close range Thomas Robinson header after a good run a cross by Thomas Haigh. The visitors continued to push forward and it was no surprise when they opened the scoring somewhat fortuitously on 23 minutes. Iwan Heely sent in a cross from the left which Kieran Walker met ahead of Mohammed Ibrahim, only to head the ball past Steggles and into his own net. The Carlton captain took just five minutes to make amends with an instrumental part in the Millers’ equaliser. His long throw was met by a powerful Ben Hutchinson header. Goalkeeper Jordan Porter had come off his line and called for the ball but was nowhere near it and could only look on helplessly as Hutchinson’s header flew over him and into the unguarded net. Three minutes later another Hutchinson header from a Walker throw drew a fingertip save from Porter, who this time stayed on his line. Early in the second half Edward Clarke did well to block an Ibrahim effort before Scott brought on Smithson to bolster the midfield. The change almost had an immediate effect as Smithson turned beautifully and crossed for Hutchinson whose miscued effort eventually went out for a corner. Heeley then fired a golden chance over the bar for Brighouse after a good run and cross by Jack Normanton. There was controversy when the visitors bagged the winning goal on 82 minutes. A ball into the area looked to have been deal with as Carlton moved the ball into the left back position. However, the Millers took far too long to clear it and when the ball was eventually struck, the clearance was blocked and sent straight back into the Carlton penalty area. Normanton fired at goal, Steggles made a superb save tipping the ball onto the post. The rebound fell to Johnson whose header drew another magnificent Steggles save. The ball was cleared away with Brighouse claiming it had gone over the line. The referee and players looked to the linesman, who made no signal and looked to indicate “no goal”. The game played on with Carlton on the counter attack through Smithson who beat one defender but his shot ricocheted off a second and was gathered by Porter. Only then, a minute later, did the players realise that the referee had gone to speak to the linesman at the behest of the Brighouse players and he must have indicated that, despite his lack of a flag, the ball had indeed crossed the line because the referee then signalled a goal. Three minutes later matters got worse for Carlton as Blake went down in a challenge with James Hurtley and after lengthy treatment on the pitch he was stretchered off. Having used up their three substitutes Carlton played out the final five minutes with 10 men and were unable to fashion a second equaliser.